Man oh man, we are almost to Wednesday, which means new comic book day, which means another round of new number one issues from the DC reboot. Being only one person I wasn't able to get a full review on EVERY new issue last week, but I think I gave a valiant effort with reviews of Action Comics, Animal Man, Batgirl, Batwing & Detective Comics. So to wrap up the rest, I present to you my RAPID FIRE REVIEW of the remaining titles released the week of Sept. 7th. 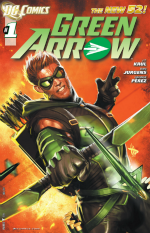 It seems we have here the Green Arrow familiar to those who watched "Smallville". A young rich industrialist doubling as a super hero. This time he has a team of people working behind the scenes for him gathering intel, making weapons etc. A solid first issue, easily accessible to new readers, but nothing to really note. Solid pencils by Dan Jurgens (minus the occasional weird facial stubble) and Krul has a firm grasp on the character. I'll stick around to see how it progresses. Hawk and Dove are the Avatars of War and Peace. This titles is one of the few that draws heavily from events that took place prior to the reboot. To me it was off-putting and because the events it draws from were so recent (Brightest Day) it felt like this book doesn't fit in the "New 52". Rob Liefeld's art also reminds me of the 90's (not in the best way) which I know is why DC brought him on to the title. One of the goals of the reboot is to attract new readers but also lapsed readers from the 90's. This issue was not strong enough for me to pick up issue 2. The fan favorite title from the 80's and 90's returns!! Sort of. New readers get a lot of characters introduced to them fast. It's a some what solid issue but not a lot of "WOW" in it. There was a little too much focus on Guy Gardner being upset that Booster Gold is leading the team. Lopresti's art is great and Jurgens is a true pro so I will stay onboard to see how the title progresses. This was a surprise hit for me. I really enjoyed this reboot of the Sgt. Rock character for the modern age. This time we follow Joe Rock (which I hope is an homage to Joe Kubert) a military man fighting in a work of superheroes AND villains. I like that DC has a title out there that deals with normal people fighting in realistic conflicts in the DC universe. I guess a bit like Gotham Central focused on the Gotham City Police Dept. 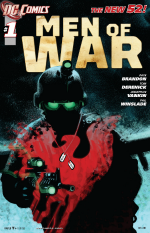 tom Derenick's art is great and gives a claustrophobic feel to the battle sequences. FYI: This is one of the $3.99 titles because I a secondary story by Jonathan Vankin with art by Phil Winslade. Fantastic art by Keith Giffen, however, this Jack Kirby inspired title fell short for me. Reading ALL the new DC titles you get a sense of continuity and cohesiveness that is not present in this book. I won't be returning. Stack Shock seems to be the Spider-man of the DC Universe. A young hero dealing with growing pains (getting a drivers license, school, family) while spouting sarcastic quips as he fight super powered villains. A possible good read for fans of the Static Shock cartoon a few years back or the MILESTONE comic book imprint. The Authority PLUS Martian Manhunter?!? This title SHOULD be amazing, but unfortunately it lands in the "okay" category. New readers will be definitely confused if they have no knowledge of The Authority (one of the greatest super teams EVER). Having a lot of faith in Paul Cornell's abilities I'm sticking around. Sepulveda's art leaves me unimpressed seems very static. On a side note (not Sepulveda's fault) If there was a group of superheroes that DIDN'T need a costume/age reboot it was Midnighter and Apollo. Finally Swamp Thing is back in his own title in the DC Universe. This is a great first issue by Scott Snyder and Yanick Paquette. There is a little bit of prior knowledge of DC current events (the ending to Brightest Day) but nothing so major to take away your enjoyment of the book. This book includes an amazing opening sequence and one of the creepiest ending sequences I've read in a while. I'm so glad horror comics are making their way back into the DC continuity. So there you have it folks! All 13 titles released on week 2 of the DC new 52. Whew, just in time for the next 13 to come out......oh man. Thanks for reading and please leave some comments if you are enjoying the reviews. 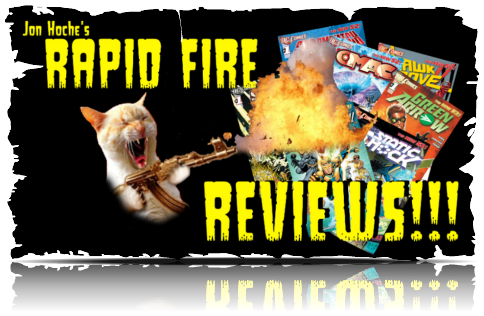 I'm always trying to improve the ol' reviewing chops as I go.